North Korea has accused the US of "luring and pushing" Otto Warmbier into breaking the country's laws, the foreign ministry said in a statement. The teen died in June shortly after he was released from a North Korean prison for stealing a sign last year. There was no clear indication that he had been tortured, a coroner said. "Trump and his clique, for their anti-DPRK propaganda, are again exploiting the death of Otto Warmbier, an American college student who had been under reform through labour for the criminal act he committed against the DPRK and died after returning to the US," North Korea's foreign ministry said in a statement on Thursday, referring to its acronym for Democratic People's Republic of Korea. The comments came after an Ohio county coroner had determined Mr Warmbier had died from a lack of oxygen to the brain. The coroner's report contradicts statements made by the US student's parents in a TV interview with Fox on Tuesday. They said North Korea had "systematically tortured" their son after he was jailed for stealing a sign during a holiday in Pyongyang in 2016. "We don't know what happened to him and that's the bottom line," Dr Lakshmi Sammarco said in a news conference on Wednesday. 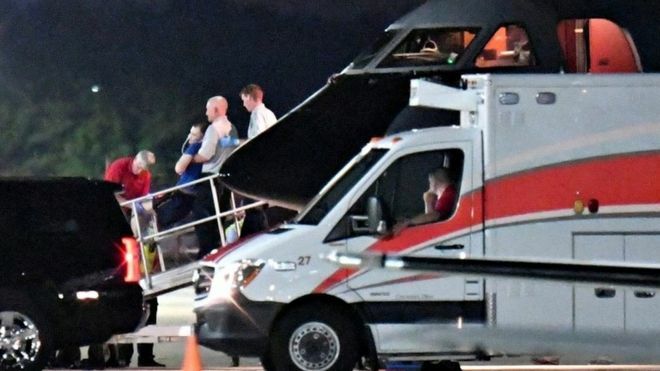 Mr Warmbier arrived home in June in a state of "unresponsive wakefulness" after he had been released by Pyongyang on medical grounds. North Korea said he contracted botulism shortly after being sentenced, but US doctors have disputed this. 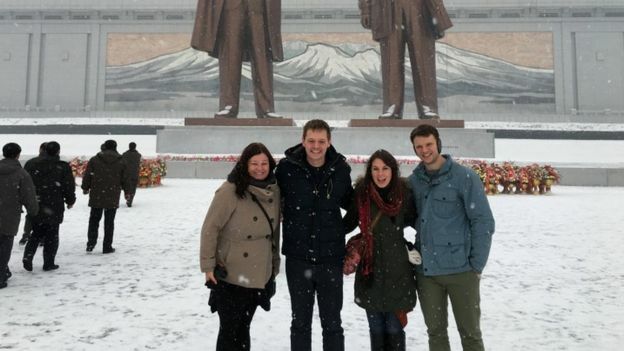 In their interview with Fox and Friends, Fred and Cindy Warmbier said when they first saw him on his return, their son was "jerking violently" and made "inhuman sounds". They said his arms and legs were "totally deformed", he had a scar on his foot that had been an open wound for some time, and his bottom teeth looked "like someone had taken a pair of pliers" to them. "Otto was systematically tortured and intentionally injured by Kim and his regime," said Mr Warmbier. Dr Sammarco conducted an external examination and scans of Mr Warmbier's body - his parents refused a post-mortem. She said she was "surprised" by the Warmbiers' statement. "I felt very comfortable that there wasn't any evidence of trauma" to the teeth, she told reporters. There were only small scars on his body, including his foot. One of the scars could not be explained. But she said his body and skin were in "excellent condition" for someone who had been bedridden for more than a year. She said he died from lack of oxygen and blood to the brain caused by an injury more than year before. Muscle spasms, eye movements and noises can all be consistent with oxygen deprivation. US President Donald Trump had called the Warmbier's appearance "a great interview", and said "Otto was tortured beyond belief".